These days I think most everyone who’s interesting in food – from either a taste or a sustainability perspective – has discovered the benefits of shopping at local farmer’s markets*. Fresh, local produce that tastes great and supports the local community: what’s not to love? 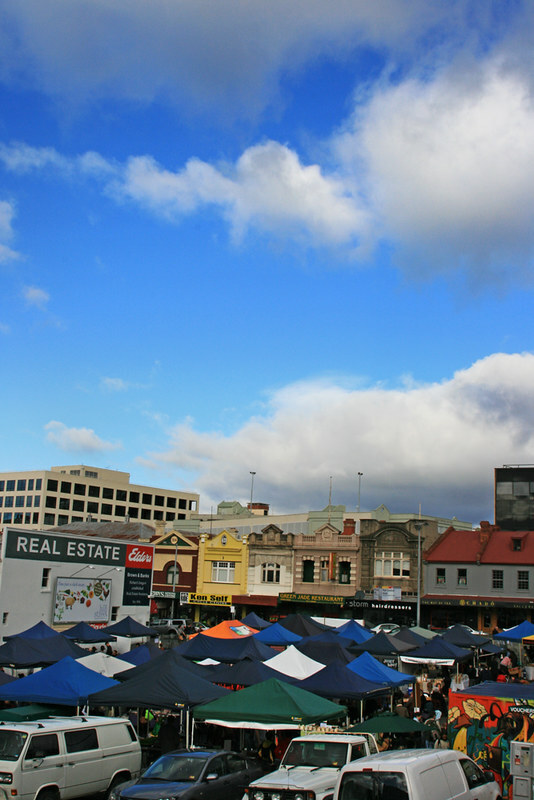 Farm Gate Market, every Sunday morning in central Hobart. The food is fresher, thus packed with more nutrients and will keep fresh for longer. You can get a broader range of varieties, bred for flavour and to suit local conditions, rather than shelf-life and supermarket aesthetics. You’re supporting smaller farmers who tend to manage their land more sustainably than the big agri-business growers that supply the supermarkets (where often decisions are made too far away from the land). You’re supporting the local economy, investing directly into your own community instead of creating profits for multi-national corporations. You’re shrinking your carbon footprint by purchasing food that’s locally grown and in season, avoiding energy use for storage and transport. These are all very good reasons to consider shopping at farmer’s markets (though there are potential down-sides in terms of global food security, affordability and global distribution of wealth, but that’s a complicated discussion for another day) and what originally got me out of bed on a Sunday morning to head down to Farm Gate, but it’s not the main thing that keeps me coming back. What keeps me supporting my local market is the sense of community this simple activity builds. Sometimes I’ll wander the market with a friend, making new connections as we meet people they know, but often I’m happy to wander alone and strike up conversations as I go, a question about growing techniques or flavour combinations turning into a connection over shared interests. Over time I’ve come to know a few of my favourite stall holders and growers, learning about their businesses and the passions that drive them to produce small-scale, high quality food. 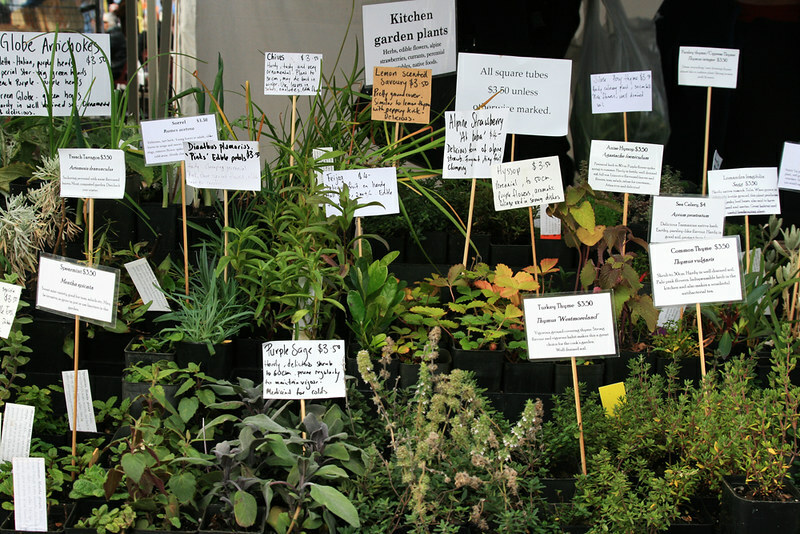 Provenance Growers temp me with a diverse array of grow-your-own edibles to try. There’s Ross and Matt with their free-range heritage-breed pork products, who have made me finally understand what the fuss over bacon is about. There’s the amazing Paulette of Provenance Growers, with her near-encyclopaedic knowledge of unusual edibles and native herbs who is enabling my ever-expanding herb collection (and her mum, who keeps me happily supplied with finger limes). Mark of the Naked Carrot and grower of tasty micro-veg has a ready smile and says nice things about my photography, and Masaaki Koyama makes the best sushi I’ve ever eaten (and has cooked for Iron Chef Sakai!). 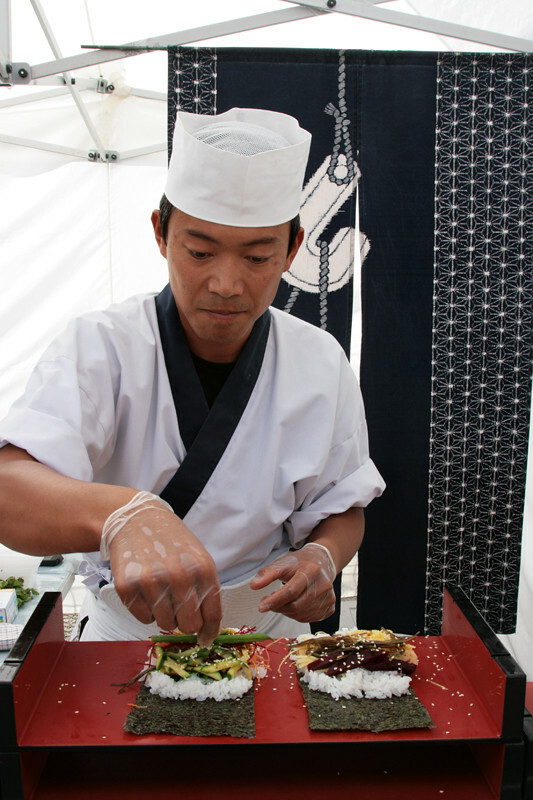 Masaaki makes amazing seasonal sushi from fresh local produce. Through these talented cooks and growers I’ve learnt more about where my food comes from and the challenges local farmers face. I’ve learnt what to do with broad beans and mizuna, eaten purple spuds and slippery-jack mushrooms and ditched growing parsley for the tastier native sea celery. From the market I’m learning what to sow and harvest each season in my own little patch, when dairy goats produce the best milk and how to cook a cassoulet, but more than that I’m making friends with the people who feed me, connecting a little deeper with my local community. From the corner store to your favourite café, food has an enormous power to draw people together, and no-where have I found that more strongly illustrated than at the market. These days I look forward to catching up with my favourite market people as much as to the delicious produce I’m going to be bringing home. Farm Gate Market: bringing Hobart people together and building a more connected community through food. Have you nurtured a sense of community through food? Got any ideas of how we can connect our communities through food in places without farmer’s markets or where socio-economic drivers keep people away? I’d love to hear about community gardens, co-ops and other projects that grow more than just food and feed more than our bellies. * Or a CSA veggie box or local produce co-ops and market gardens. My friend Kat has a great post about why she chooses to eat locally sourced food: read it here! I really enjoy going to farmers markets, I go to the Jan Powers ones up here, and they’re always packed which is great (we don’t get sushi though, your photo looks amazing!). I do prefer to shop and go out to eat around my own area in Brisbane to support local business. Brisbane people aren’t as community minded as Tasmania though, I guess being a bigger city this might mean being less community minded and more of a money saving mentality in terms of people going to supermarkets more. I went to the Jan Powers Powerhouse market a couple of times but actually found it really annoying! Too many inconsiderate people with trolleys standing in the middle of the walk-ways and very few things I actually wanted to buy (since I enjoy cooking and have dietary restrictions I don’t buy much pre-made). Instead I used to go to the Rocklea markets every second weekend to stock up on fruit & veg at budget prices. I have a little more disposable income these days and a much greater awareness of the social, environmental and economic issues around food, and I’m pleased to have found a local farmer’s market that supplies great straight produce as well as the value-added stuff. That said, I’ll still buy the occasional bit of veg from the supermarket – I’m far from perfect. There’s also the element of elitism around markets like these: not everyone can afford to shop there and certainly the majority of Hobart’s population is still buying their food from the big supermarkets. I’m lucky that I can afford to spend a bit more to live more in tune with my values but I think we need to understand that not everyone can. And yes, Tasmanian parochialism does have it’s good sides! What a lovely write up and stunning pics! We love selling at Farm Gate, the market has such a strong sense of community and all the stall holders are very supportive of one another. Our dinner every Sunday night consists of many and varied goodies collected earlier in the day…never are two meals the same. I also have to agree with you….best sushi EVER!! Hi Barbara, and thank you for your lovely comment. The atmosphere at the Market is lovely, with a great attitude from both the stall-holders and the customers. I think the folks behind Farm Gate have cultivated something quite special. Perhaps I’ll see you there one Sunday! They sure have…it’s very special, and like you said…small steps are better than no steps in the right direction!